The holiday spirit is dancing through Albuquerque and The University of New Mexico. From the tumbleweed snowman on I-40 to the collectible holiday ornaments in the UNM Bookstore, signs of the season are popping up all around. 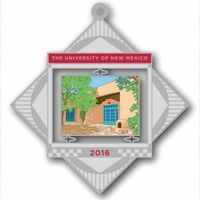 UNM’s 2016 ornament is the 9th in the collectible series, and commemorates the Maxwell Museum of Anthropology. Artist Jana Fothergill has been designing the decoration since its inception by the UNM Parent Association in 2007. This year it depicts the blue doors of the Anthropology Department and the small Native American orno (oven) outside, framed by green leafy trees and a thin metal outline. Signs of the season are up all around the UNM Bookstore on Main Campus. “I based the design of the frame on pueblo pottery designs,” she said, stating she tries to match the exterior frame design to a piece of what the main picture represents. The UNM Parent Association decides what will be on the decoration every year; and starting with just a photograph, Forthergill hand-draws the ornament design, scans the drawing into the computer and digitally colors it. In all, the process from photo to ornament takes about a month and a half to two months. Artist Jana Fothergill says coming up with the ornaments each year is a creative project. 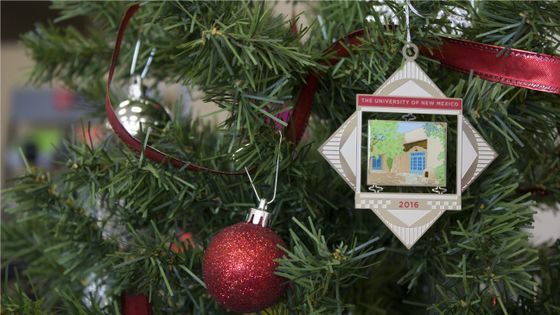 The 2016 ornament now joins others in the UNM Bookstore as part of a collectible series. People looking to own all nine don’t have much time to complete their collection. This is the last year the ornaments will be sold retroactively. After the current stock of previous years’ ornaments are gone, no more will be ordered. 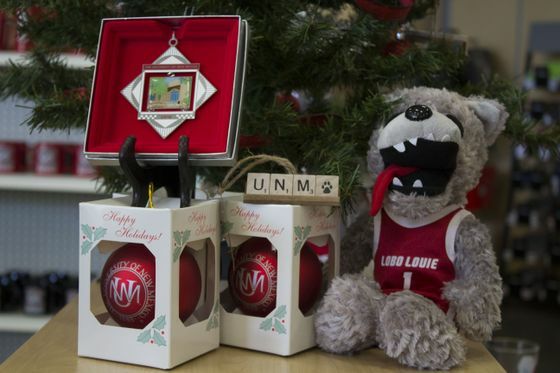 As always, the ornaments are priced at $18.89 in honor of the year UNM was founded. Every year, the decorations serve as a reminder of what UNM contributes to the community and many research fields. Hailed as one of the finest in the nation, the Maxwell Museum provides visitors with a unique look at the cultural heritage of the Southwest. Edgar Lee Hewett established the UNM Anthropology Department in 1928, then four years later founded the museum. The Museum of Anthropology of The University of New Mexico opened in 1932 as the first public museum in Albuquerque. Its purpose was to house artifacts gathered from field schools of archaeological research associated with the UNM Anthropology Department, the School of American Research, and the Museum of New Mexico. The 2016 UNM Collectible Ornament memorializes the Maxwell Museum. Exhibits were first situated in UNM's Rodey Hall, which was demolished in 1971. The museum moved to Scholes Hall in 1935, then to the current site in 1961. In 1972 a major construction project funded by philanthropists Dorothy and Gilbert Maxwell expanded facility, which was renamed in their honor. Frank C. Hibben was the first director of the museum and expanded its holdings by collecting archaeological materials from around the world and through trades with other museums. Among the uniquely southwestern showcases, the museum's courtyard features a traditional clay orno. The orno and courtyard are used every year by the Edaakie family of the Isleta Pueblo, for bread baking demonstrations that draw-in an enthusiastic campus community for a special treat. This holiday season, the significant research contributions of the UNM Anthropology Department and the Maxwell Museum will be remembered by all who buy the annual collectible ornament. As an added treat, Fothergill will be at the main campus bookstore to personalize the pieces Friday, Dec. from 12 to 2 p.m. They can also be purchased online at http://bookstore.unm.edu/. All proceeds from ornament sales benefit the UNM Parent Association Scholarship Fund.